We make maple syrup on the Minnesota family farm in March and April. 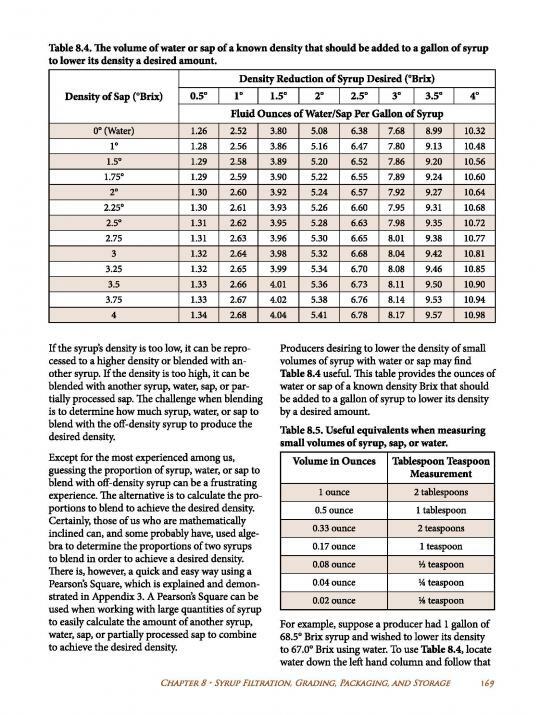 The first step in making maple syrup is selecting a maple tree of at least 12″ in diameter. (We only tap sugar maples but other maples are often tapped, including red maple, silver maple and black maple, even boxelder.) Next we drill a 7/16″ hole at a level or slightly downward angle, in about 2″. Trees over 18″ get two buckets, and those over 24″ get three buckets. Into this hole we use a hammer to tap in a spout, also known as a spile. On the spout we hang a covered bucket. 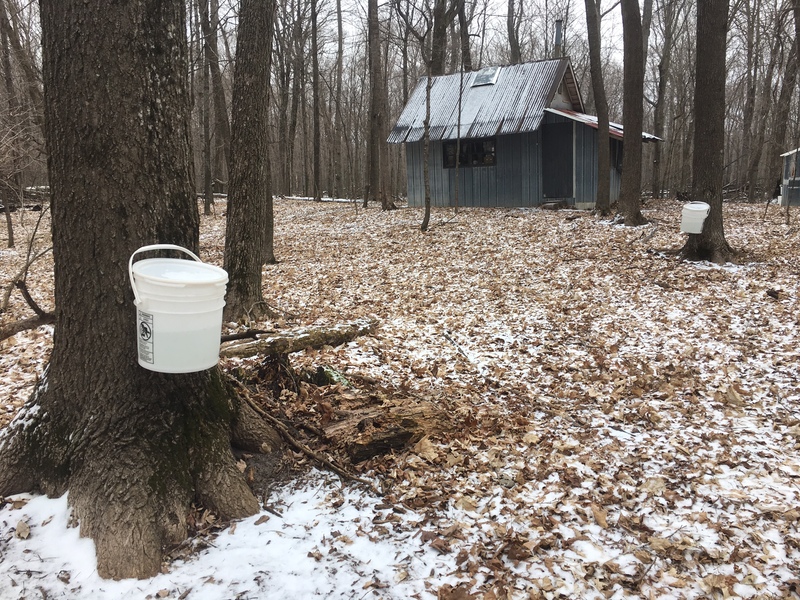 The sap might run on a warm day in the winter, but it runs best in the spring when nights are freezing and the daytime temperature is in the 40s. On many days the sap doesn’t run at all, and on others one spout may produce 2 gallons of sap, or more. The sap is as clear as water, and very slightly sweet. 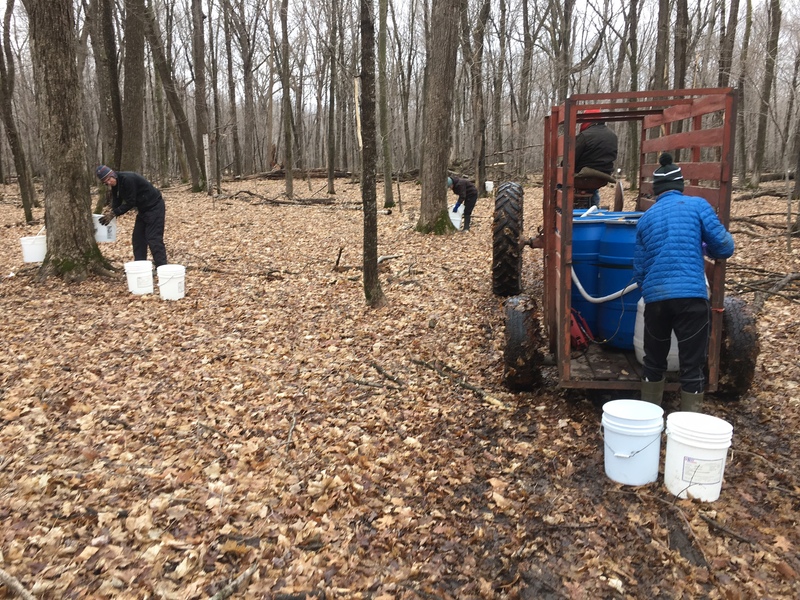 When the sap is running, most buckets are gathered once a day. On this day, most buckets were half full, as you can see in the buckets hanging on the tree, above. I wish the sap ran that well every day! We boil with a wood-fired evaporator with two stainless steel pans on top. Each pan is partitioned with small gaps in the bottom of alternate corners of the partitions. Sap runs in at the smokestack end of the pan. A float controls the depth of the sap to about 1 1/2″. Since liquid seeks it’s own level in the pan, it slowly runs in one direction as it replaces the evaporated liquid. The first section is therefore nearly raw sap, the next a bit sweeter and so on, until the section at the opposite end becomes syrup. 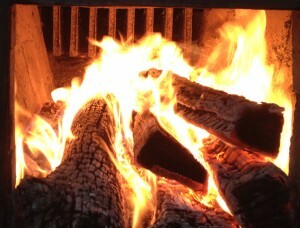 The fire is directly under the flat-bottomed “syrup pan.” In the background are the rectangular sap-filled flues of the sap pan. At the opposite end of those flues is the smoke stack. This is a photo of the A-frame where we do our boiling. The stove burns so cleanly very little smoke comes out of the stainless smokestack, but as you can see there are clouds of steam under the right conditions. Just out of site are two tarp-covered stacks of firewood. To the right is the red sap-gathering trailer. Next to the smoke stack the white cubic object is our sap feeder tank, in which we store sap to be gravity fed into the boiling pan. It takes about 40 gallons of sap to make one gallon of syrup! We have two sets of thermometers to help us determine when a batch of syrup is ready, which is about 7 degrees above the boiling point of water. 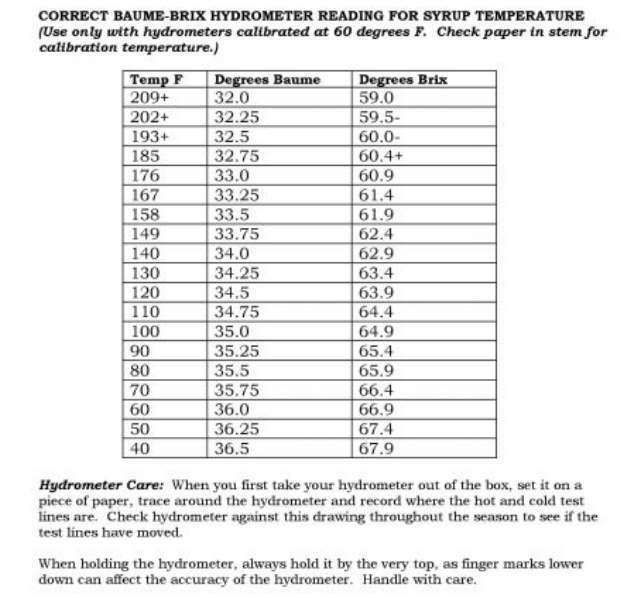 Each day we verify the true temperature with a syrup hydrometer. When the syrup near the draw-off point is ready, we slowly trickle it out while monitoring the temperature, closing the valve again when the temperature has dropped, indicating thinner syrup. We might draw about a gallon of syrup an hour, when we are boiling at full speed. A whole lot of work proceeds the process before and after that point! We draw our syrup slightly heavy, then then it to the perfect sugar content. Harmless minerals, known as sugar sand, will slowly settle in finished syrup. 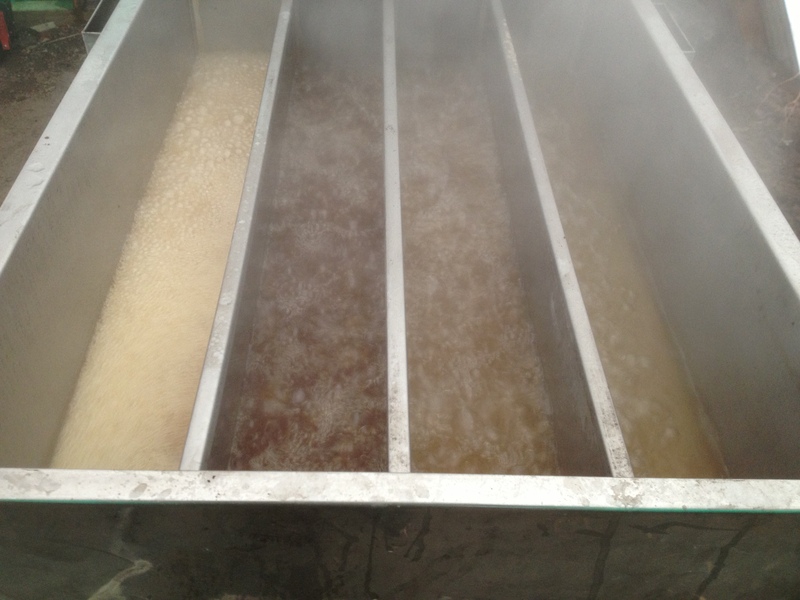 For the final filtering, we allow the syrup to settle and then pour the syrup off the top while discarding the sugar sand. Next we do the final filtering through pre-filters and a special thick Orlon syrup filter. Coffee filters and similar will often allow sugar sand through. Just before canning we verify the density with a syrup hydrometer to make sure the sugar content is right, about 66.9%. Too high and it can crystallize, (add a little warm water and swish) and too low and it doesn’t keep as well. The clear syrup is heated to 185-190 degrees F. on a wood stove in our “sugar shack” and then canned before the temps fall below 180. Temperature is critical, the syrup must be hot enough to prevent mold but if it gets too hot more sugar sand can form. 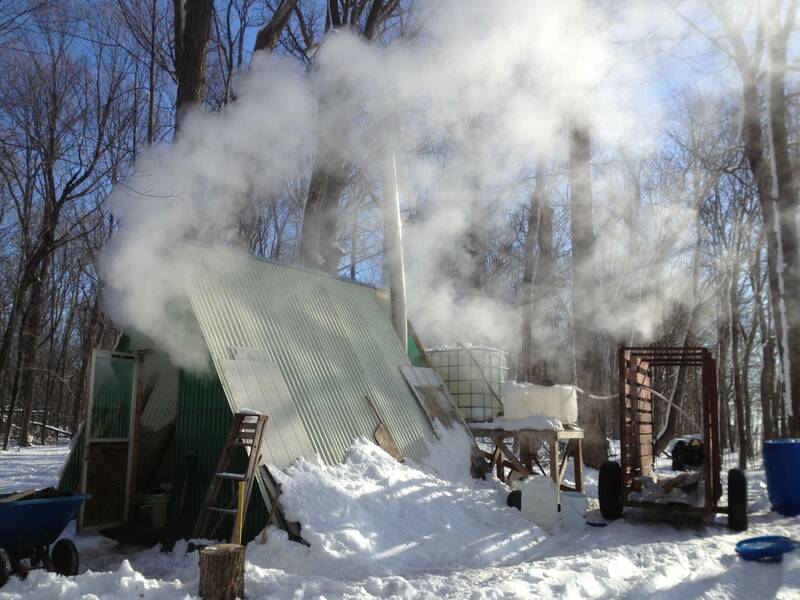 Making maple syrup is an art and a science. It’s a whole lot of work and a whole lot of fun. My wife and children and I moved to CT a few years ago. We have 11 acres of forest land with lots of maple trees. We decided to try to make our own maple syrup, starting this coming winter. I know it is going to be hard work. Do you know where I can get an idea about what kind (design) of wood burning fireplace I can build in the sugar shack I will begin shortly to build? Can you sen me a design (just for the fireplace).